What great news for Carolina! *Update 3/18/19: See more on this story from ITS! This story includes interviews with Gina Bradford, our Classroom Hotline Manager, and Bob Henshaw, our CFE Liaison. All UNC instructors are invited to visit the Flexible Learning Spaces! The CFE has several events planned for you to visit the flexible classrooms, as well as learn about best practices and effective design strategies for your in-class activities. We invite you to register for any that interest you! Registration for all sessions are found on the CFE Learning Spaces Initiative page. Visit a recently renovated classroom, chat with instructors who have taught in these spaces, and meet instructional support staff from several campus groups. No registration required. Find out how you can take advantage of the new classrooms. Presenters will model practical teaching techniques that can be implemented in any class. Learn about examples of potential group work and projects that fit course goals, and reflect on how the instructor’s role changes using this format. You’ll also discuss common group work pitfalls and strategies to overcome them. Discuss strategies for developing effective question prompts for in-class activities and out-of-class assignments. Don’t have time to stop by on multiple days? Sign up for this half-day event to get a comprehensive overview of best practices of teaching in the new spaces. It will incorporate strategies discussed in the previous workshops listed above. We are excited for faculty and how you all will use these new Flexible Learning Spaces! Thank you to the CFE for providing these many learning opportunities on campus. While students may not have noticed a real difference in filling out scantrons for their exams in class, the Exam Scanning system underwent a big change just last fall. Students still use the same ScanTron forms they purchase at UNC Student Stores and those scantrons are still brought to our Classroom Hotline group in Peabody Hall, which manages the exam scanning service. 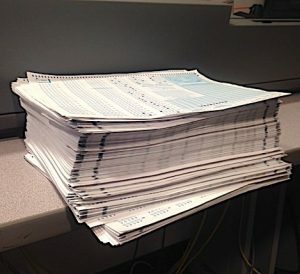 The system used to process these scantrons was just replaced by InstructorTools by DigitalDesk. The old system was developed in the mid 1980s by a current ITS staffer, Todd Lewis. While it has been extremely reliable for 35 years, it was time for some updates! Another great benefit to the new system is the integration with ConnectCarolina and the additional checks and balances that come with this integration. Instead of accepting all scantrons, the system will alert when there are student mismatches so that instructors can more quickly remedy issues and provide feedback to all students in their course. Those results can then be imported into Sakai. To read the full story on the Exam Scanning project and to hear how well the new system is working for the School of Nursing and across campus, check out ITS News. The ITS Annual Report was just released last month! Find out what exciting work Teaching & Learning and all of Information Technology Services has worked on from August 2015 through July 2016. See more highlights from Teaching & Learning! Another classroom that got a huge upgrade is Greenlaw 101. If you haven’t been to this room in the past year, we highly recommend taking a quick stroll to Greenlaw Hall! Our very own Bob Henshaw led a planning group comprised of staff from ITS, the Center for Faculty Excellence, and campus administrators, who worked with over two dozen faculty members across a wide range of disciplines to identity key instructional goals for a final design. Greenlaw 101 has been transformed from a lecture hall with stadium-style seating into a classroom with a middle ramp that splits three tiers into six learning zones, populated with moveable tablet-arm seats on casters. Instructors can now easily move around and interact with individual students and groups. Several monitors also line each section of the room, which allow students to easily view content and display their devices. With 60 printers in 45 locations across campus, CCI Printing is one of the most convenient ways for students to print. The University’s official mobile app, CarolinaGO, was launched in November 2015, and it includes the CCI Printing map. The map automatically updates every 2 minutes, providing users with live updates of each printer’s status, nearest printer locations, and better support since we can easily see if a printer is low on supplies or needs technical attention. Did you know that 70% of all instructors now use Sakai? Check out this Q&A on Sakai Stabilization with Jeremiah Joyner, Manager of the Sakai Support team. In case you haven’t heard, we are upgrading to Sakai 11 in December, bringing even more updates and new features to the system! You can view the full ITS Annual Report from all ITS departments, which includes stories, videos, and other stats on the services we provided to the UNC Campus. Happy First Week of Classes! We hope the Fall semester is off to a great start for you and that everything has been running smoothly. To help instructors get familiar with the equipment in classrooms, our Classroom Hotline group put together the following instructional video tutorial for classrooms with one projector. We invite you to check it out! Stay tuned for more video tutorials! Last semester, Classroom Hotline upgraded classrooms across campus with the capability to wirelessly project personal devices using Mirroring360 by Splashtop®. Have you recently updated your device to iOS 9? You may have had some trouble mirroring your Apple device in the classroom, but there is good news. Mirroring360 has been updated in classrooms to version 1.5 to support screen mirroring on iOS 9 Apple devices! All you need to do is re-arm the license key on your Apple devices to continue mirroring your content. Why might you want to mirror your device in the classroom? Check out the Mirroring360 Brochure to see more features and how it works! 5. Verify both Mirroring services are running, and you’re all set! You can also download these instructions here. Contact Classroom Hotline if you have any questions by picking up the red telephone in your classroom or calling 919-962-6702! As our Classroom Manager, Gina Bradford, explains, “Carolina’s current and future student populations have grown with technology, making them eager to use it for educational purposes (ITS News). Classroom Hotline within our Teaching & Learning department has been installing updates in classrooms since 2013 and will continue the renovation project through the summer of 2016 to bring updates that today’s students expect to see at a university. In the video below, Gina Bradford, Manager of Classroom Hotline, and Father Michael Antonacci, a Teaching Assistant in the Physics Department, describe the upgrades implemented in Phillips Hall Room 335 for the Math and Physics Departments and the positive impacts they have made on the student learning experience. The renovations include upgrading back end equipment, putting technology on the network, and adding options for instructors to incorporate their mobile devices into their instruction. As we mentioned in our previous post, instructors can now display their Apple devices in classrooms and no longer have to rely on VGA cable connections! This mobility allows for more interaction between the instructor and students. Not only has the technology been upgraded but furniture and seating has been included with peer-to-peer learning and collaboration in mind. Instead of the traditional one-direction-lecture type of seating, several round tables with power have been installed to encourage discussion and make it easier for students to work together on projects and compare answers. Students no longer focus on just one instructor but are interacting and teaching each other. Four projector screens were also added for easier visibility. As Father Michael Antonacci notes on less tech savvy rooms, if they can’t see, students “can’t learn, can’t ask questions, can’t interact,” hindering them from engaging in active learning. The renovation in Phillips Hall Room 335 has been tremendous in giving students an advantage in learning and promoting peer instruction! See the original story on ITS News. While most of Carolina campus was away on Spring Break a couple of weeks ago, Classroom Hotline was busy at work installing updates on the classroom computers. You can now project Apple devices in the classroom! Instructors teach a variety of subjects, so there’s no telling how many different kinds of applications may help an instructor further enhance their instruction. Depending on your area of expertise, there are apps out there that allow you to visually enhance and zoom into specific sections on graphics, maps, and pieces of art. Others may use apps to teach music, demonstrate how the brain functions, or draw diagrams and figures. The options are endless! With the new support of Mirroring360 by Splashtop® in campus classrooms, instructors can now mirror their iPads and iPhones wirelessly to the classroom computer to display content from their iDevices. You no longer have to rely on adding your content to the classroom PC to project to students but can now demonstrate your material through your Apple devices. Mirroring360 also allows you to pass your tablet around the classroom for students to demonstrate what they are learning in the class. What a great way of bringing learning into the open! Capture from Desktop Doc Cam for web conferencing – great for incorporating guest lecturers in class! See what all the doc cam can do. You can find more Classroom Support documents here. If you need help, just pick up the red telephone in your classroom or call (919) 962-6702! The ITS Annual Report is in! See what Information Technology Services has been working on in 2013 and 2014, with special highlights on Teaching & Learning! Allows for guest speakers and subject experts in the classroom! 232 new wireless access points to bring wireless internet to 182 classrooms! Don’t forget that red telephone in the classroom! Any time you need assistance, just pick up that red phone to connect directly with the Classroom Hotline. Because the Hotline monitors classroom equipment remotely, chances are that we may have already discovered and fixed the problem before the classes started, allowing you to focus on what’s truly important–learning in the classroom! If you have not heard, there has been a big movement towards Massive Open Online Courses (MOOCs) in higher education these past few years. UNC became a part of the MOOC Movement in 2013 by offering several MOOCs through Coursera. Way to go, Carolina! It’s been a great year for teaching and learning! Classroom Hotline has been hard at work with several classrooms on campus going through big upgrades! One of those upgrades you may have noticed in most rooms is an updated document camera. We cannot always rely on electronic versions of content, which is when doc cams come in handy! So what exactly is a document camera? Document cameras are visual presenters that project physical objects onto a screen. They are great tools for sharing printed copies of material in class, such as textbooks, sheet music, and art, or working out math problems, annotations, and other hands-on activities. You could even project yourself and your students! Doc cams basically display any object or activity to a larger audience. See more uses for doc cams from the University of Notre Dame. But wait, your Doc Cam can do even more! Doubles as a webcam and mic for Skype, MS Lync, WebEx, etc. With the built-in microphone and camera, these doc cams are great for ad hoc lecture capturing and web conferencing. You can very easily save your work and share it live with your colleagues and students. It is now easier than ever to connect! See the full ad on what your Doc Cam can do. Contact Classroom Hotline for details on using any of these features in your next lectures and meetings! When used effectively, technology can enhance the learning environment, elicit deeper understanding, and provide a powerful experience for users. There are so many resources here at Carolina that you can use to strengthen your studies and practices. Let us help you discover new technologies and get the most out of tools you are already using! How do I use the technology in my classroom? How can I best utilize the tools in my Sakai site? Is there a place I can access software for free? I am new here. What resources are available for me to use? I have a research project and need a place to collaborate with my colleagues. How can I conveniently meet with my colleagues? We have busy schedules! Is there a way for my students to post a presentation and have their classmates share feedback and comments? Sign up for a personal consultation with a TLI Consultant to learn about what educational technologies could work for you and understand the best methods to apply! We can help you set up and structure your Sakai site to meet your course needs. Unable to get together with colleagues in person? We’ll help you create a Blackboard Collaborate web conferencing room so you can conveniently meet without finding a location and time with your busy schedules! Want to share media and have students provide comments? Let us help you set up VoiceThreads! If you have questions regarding your classroom, please contact Classroom Hotline. Simply pick up the red telephone in your classroom or call (919) 962-6702 to speak to classroom support. We can also provide a classroom demonstration to help you become familiar with the technology available to you! Do your instructors require certain applications not already on your computer? Looking for free software? Check out Virtual Lab! Don’t forget that you can always contact the ITRC Help Desk, which provides support 24/7. You can give them a call, chat online, submit a help ticket, or walk in and speak to someone in person–whatever you prefer! Let us know how we may best assist you. We hope to hear from you soon!